For the millions of people that have actually seen a UFO this story does not hold out much hope that we will ever get to the bottom of the phenomena. Most people still have an attitude that if it does not affect me than it is not worth my time. I guess in India if politicians have any outside interest other than their jobs it is condemned. Bill Clinton, Ronald Reagan and a host of other presidents showed a keen interest in UFOs and it actually made them more interesting. NEW DELHI — With many Indians worrying about the threat of tough measures in their new government's first budget next week, a Facebook post suggesting the finance minister might be pondering less earthly matters quickly roused anger on Wednesday. India's Finance and Defense Minister Arun Jaitley speaks during a news conference in Srinagar, India, June 2014. 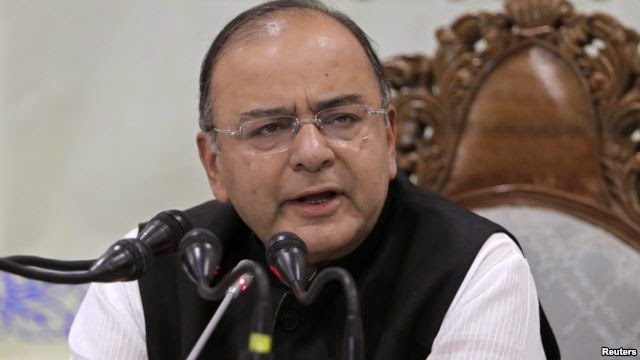 Arun Jaitley, a key confidante of Prime Minister Narendra Modi, published a message celebrating "World UFO Day" on his Facebook page, which is one of the main forums in which he publishes official information. "This day is celebrated to raise awareness about the existence of UFO's [sic] and with that intelligent beings from outer space," said the post, which was followed by Jaitley's name and included a depiction of a flying saucer in a wheat field. World UFO Day is a day dedicated to spotting and proving the existence of Unidentified Flying Objects. It was first celebrated in 2001, according to the website worldufoday.com. A member of Jaitley's personal staff, who declined to be named, confirmed that their team had posted the message about World UFO Day and said the account had not been hacked. The post was deleted half an hour after Reuters contacted the team. The post sparked a storm of criticism among his followers and was deleted after a few hours. "Sir FM, today we the people of India are celebrating the price hike day instead of UFO day," a Facebook user called VBhushan Bhushansharma said in a comment on Jaitley's post, referring to India's recent moves to raise rail fares and fuelprices. Modi swept to power in May with a vow to revive India's economy after the longest spell of growth below 5 percent in a quarter of a century, and he has since warned that the turnaround will involve some "bitter medicine." On July 10, Jaitley is expected to unveil a budget that will try to rein in a wide fiscal deficit partly by curbing the government's high subsidy bill in a country where 70 percent of people live on less than $2 a day. He said on Tuesday that "bold steps" were needed "to ensure fiscal discipline." "Sir instead of talking on outer space, please confine your discussion on the hardship faced by common men," a Facebook user called Ganesh Choudhary said in a comment on Wednesday. "People are confused and scared about the undefined miseries which are going to be heaped upon them in the names of restoring fiscal health of the country." Officials in the finance ministry said they had seen the Facebook post and advised the minister's personal media team to be more careful about what is published on his Facebook account. Investors have been impressed by Jaitley's hawkish tone.